Who wants to stay home alone on valentines weekend, right? 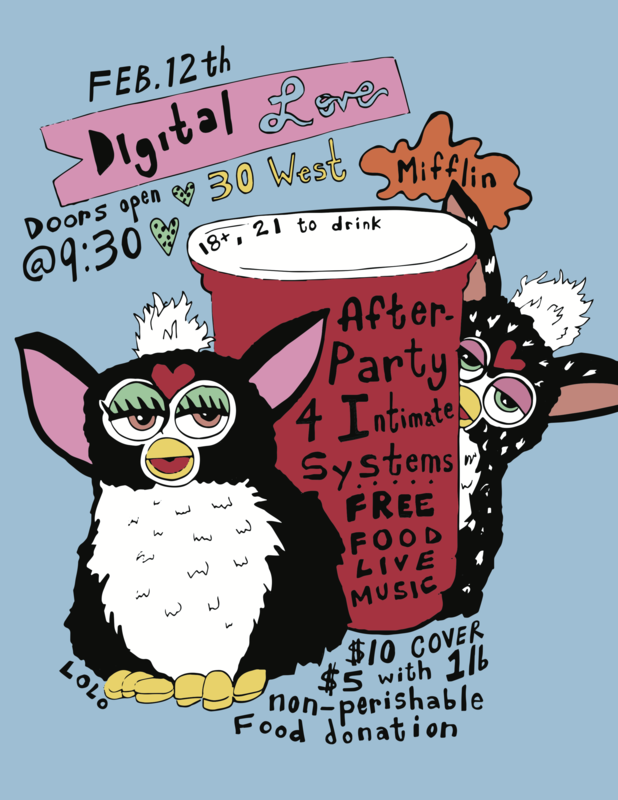 Single or coupled up, we got everything you need to have a great time at Digital Love. It's our official after party for the Intimate Systems: Opening Reception, so you know it's bout to be live. We'll be premiering the video art of several of our featured artists from Intimate Systems, coupled up with a full night of great local performers and catering from several local restaurants. Free food, live art and music, plenty of beer and wine, what else could you want? We want to make sure the party is accessible so we're charging $5 admission with a 1 lb non-perishable food donation (donations will go to help our homeless friends), otherwise $10 and you get all the food and dancing you can handle. For 21+ folks that want to drink we're asking for a $10 donation in exchange for open bar. A portion of proceeds will go directly towards providing clean water for undocumented immigrant communities in Flint, Michigan. You are cordially invited by the 100arts Artists-in-Residence to come experience our first curated exhibition of the year, Intimate Systems. Intimate Systems is a visual art exhibition featuring 25 artists from across the country whose works explore the intersection of art and science. The opening reception will be a time to meet our artists, explore the space and get first picks on works available for purchase. Free food and refreshments will be provided. We will be featuring artist Christy Grace who will be doing a live body painting demonstration and will take some time afterwards to decorate our visitors. You are cordially invited by the 100arts Artists-in-Residence to come experience our first curated exhibition of the year, Intimate Systems. Intimate Systems is a visual art exhibition featuring more than 30 artists from across the country whose works explore the intersection of art and science. The opening reception will be a time to meet our artists, explore the space and get first picks on works available for purchase.